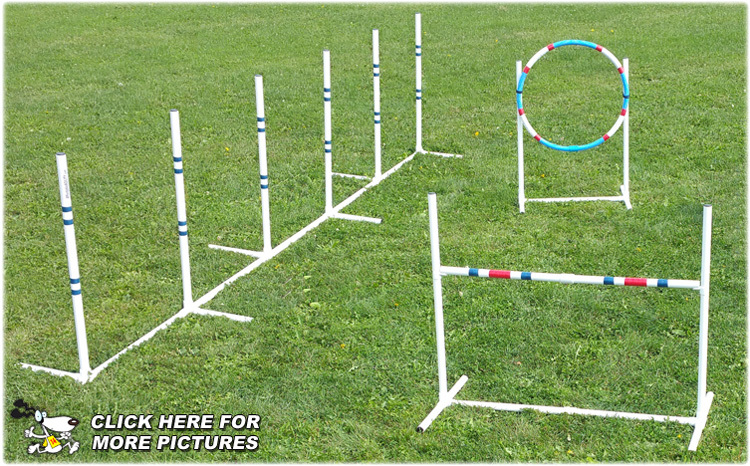 This Dog Agility Essentials set includes the essential and most popular dog agility obstacles. It includes an Adjustable Jump, Tire Jump, and Weave Pole set. It is the perfect cost conscious solution for either someone just starting out in the sport of dog agility, or even seasoned competitors looking for portable dog agility equipment for practice. Unlike other flimsy starter sets, this obstacle course is constructed utilizing materials that mimic obstacles found in competition, but in a scaled down practice version. It will hold up to the vigorous activity of training and will last for years. Each obstacle is constructed with it's own free-standing base, so you can practice anytime and anywhere, indoors or outdoors. You can also leave it outside, as it is weatherproof and UV resistant. Streamlined design make this set easy to assemble and disassemble for travel or storage. Included is simple picture orientated assembly and use instructions, along with training tips for each obstacle! For more product details Click Here. Or to see more pictures Click Here. Proudly made by Affordable Agility in the USA. Extras to make it even better! If ordered with the Essentials Set, we may be able to fit the items in the same box and reduce your shipping. We will email you with any reduced shipping cost. You can never have too many jumps! Extra set of weaves to make it a 12 pole set! Comes with connector. Click Here for more information on Weave Wires. Click Here for more information on book. Looking for a kit with even more obstacles? Check out the Agility-in-a-Bag set here.